In analogy to the ATW (Atari Transputer Workstation) I'm building up a full featured transputer workstation. It contains all required interfaces like Keyboard, Mouse, SVGA, Ethernet, SCSI, serial Ports and self-explanatory - many transputer links. This workstation has no alien I/O processor like the MC68000 in the ATW, but in a strict sense this is also not true for the MTW. But the MC68020 on the SCSI-Card or the TMS34010 on the BG-750 makes no appearance in installable software as they process only firmware code on their boards. Helios will be used as the operating system. 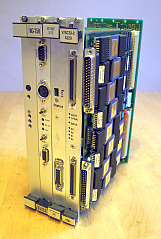 The main building block is an IMS B016 VMEbus master card with some additional VMEbus interface cards. 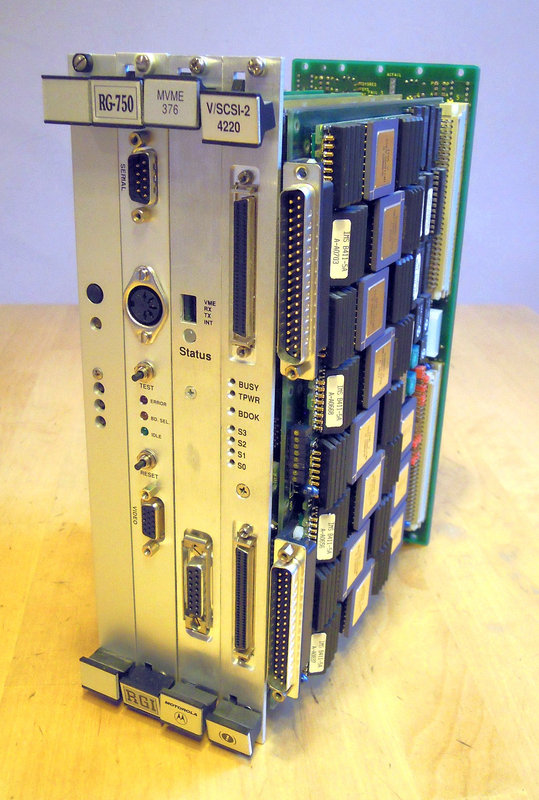 For the VMEbus interconnection I use a 5 slot J1/J2 monolithic backplane. The IMS B016 must plug into the slot 1 as it acts as the system controller. It also contributes two simple serial interfaces. The IMS B014 is required to carry a IMS B419 Graphics TRAM as the graphics part integration of the Rastergraf board will be very extensive and therefore delayed for later. On the SCSI bus is beside the hard disks also a CD-ROM and a DAT Tape connected. To support the floppy an IMS M212 would be perfect but currently there is no such thing forthcoming. There is also no parallel port intended but this can be corrected with a different daughter card on the Cougar. The housing of the VME boards is an IBM PC-Server 325. The mainboard and the CPU-board have been removed. Also the well tighten snap out back panel was replaced by a shortened (22TE) 6U 19" subrack. The big fan in the front adopts the cooling requirements of the VME cage. The power supply has a maximum power output of 240W.